Harry Potter Apron for Culinary Wizards | Nerd Much? For those witches and wizards who miss the house-elves amazing feasts, this Harry Potter apron will make you feel like you have tickled the pear and stepped into your very own Hogwarts kitchen. Perfect for showing off your house pride while creating a meal worthy of Mrs. Weasley, this 100% cotton, one-size-fits-all apron is even comfortable enough for Hagrid to wear when making his famous rock cakes (or maybe even while making a Happee Birthdae cake). 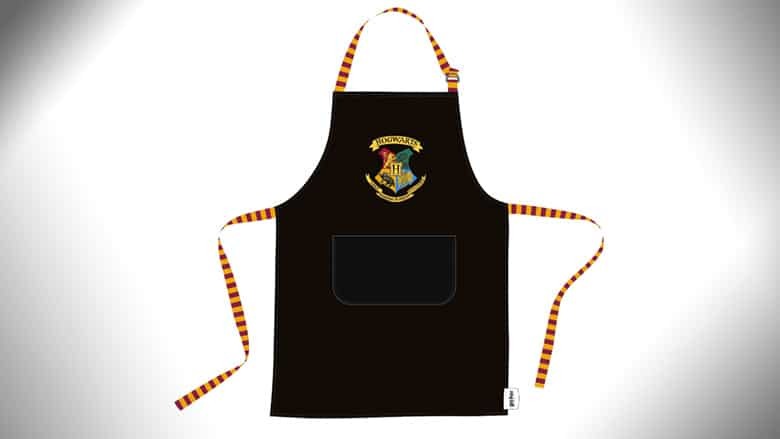 While this apron doesn’t actually have any magical properties (sorry, but it won’t suddenly make you a real wizard) it’s sleek black design, with Gryffindor colored stripes on its straps, and the Hogwarts emblem front and center will make you look like a proper member of the magical community. The apron also has a large pocket, which is perfect for storing your wand, cooking utensils, recipes, or ingredients. The Culinary Wizard Hogwarts Apron is officially licensed Harry Potter Merchandise, so you know that you are buying a quality product while supporting the creators of this amazing world. Pre-order this stylish, magical apron today and you will receive it later this year in August. Just in time for the new school year at Hogwarts on September 1st. Shipping on this apron is free for the US, UK, and EU and since this product is made with the best materials, Merchoid offers total refunds for a product returned within 100 days. We’re sure you will love your purchase, but if you have any issues returns are easy as magic. Stock is limited, so make sure to order now. Show off your magical pride, even while in the kitchen, with this stylish apron! You can find the apron on the Merchoid website, or you can go directly to the product page by clicking the link here for the Culinary Wizard Hogwarts Apron.